Originally released in 1995, the Air Jordan 11 followed Michael Jordan’s direction of bringing a more “formal” look to the court. Along with MJ’s starpower and marketability, it became one of the most popular Jordan’s of all time. Continuing the history that has almost spanned two decades, the silhouette is seen in a “Nightshade” colorway. 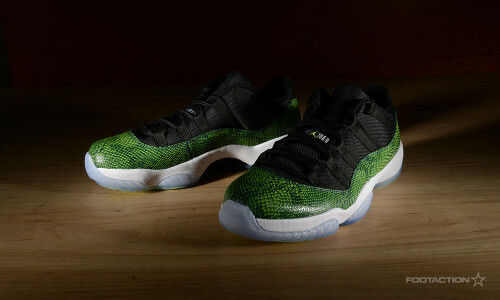 The Air Jordan 11 Retro Low “Nightshade” swaps out the original patent leather panels with a reptile overlay, while containing a contrasting black leather and mesh upper. Not to forget the details: pops of Volt appear on the Jumpman logos and herringbone. Print article This entry was posted by hhcblog on April 17, 2014 at 8:22 am, and is filed under Footwear. Follow any responses to this post through RSS 2.0. You can leave a response or trackback from your own site.